Fit A Shower Cabin In A Bedroom! 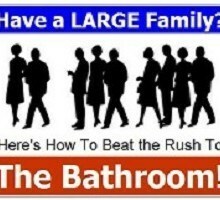 One thing that anyone from a large family is surely familiar with is the morning ritual of everyone rushing and fighting over the one or two bathrooms in the house to shower and get ready for the day. This can be a major source of frustration for everyone and cause needless fights and arguments. Still, this is something that most of us feel we simply have to get used to and deal with, as there usually doesn’t seem to be any good solution—especially if you don’t have the extra space or money to add an additional bathroom to the house. However, there is one option that most of you probably haven’t considered, and that is adding an extra shower in one of the bedrooms (typically the master bedroom or at least the largest bedroom in the house). By adding a shower cabin in the bedroom, you can work to eliminate all of the problems caused by the many members of your house all need to shower at once and put an end to all of those silly fights once and for all. This additional shower cabin can basically act as an additional en-suite bathroom (minus the toilet) allowing more people to get ready at the same time. Better still, there are a number of shower cabins available with tinted glass that will ensure you’ll still have your privacy. Nonetheless, many people are hesitant to go this route—often because they feel that having a shower inside the bedroom will stand out and look quite strange, when in fact there are a number of beautiful and stylish shower cabins available that will look good no matter where you put them. This is especially true if you choose a smaller, quadrant shower cabin, as they can be tucked away in the corner so as not to take up too much space or stand out. Still, most bathrooms are designed and built to include walls that won’t get damaged by the steam and water from showers, but this is most likely not the case with your bedroom. However, this really shouldn’t be much of an issue, as most shower cabins have an extractor fan and if required, this can be ducted to an exterior wall to disperse the steam out of the bedroom. This option of putting a secondary shower in your bedroom is definitely a great choice for larger families, but it is also a good solution for small hotels and guest houses as well. By doing so, you may even be able to charge more for your rooms, as your guests will no longer have to share a bathroom (or at least a shower) with other guests. At the end of the day, it may be necessary for you to get creative to solve the problems caused by having too many people in the house and not enough showering facilities, and installing a corner shower cabin in the bedroom is definitely one of your best, if not your only option.